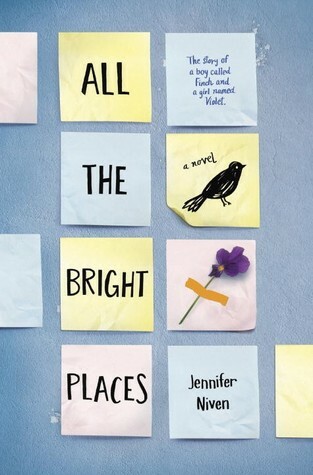 “All the Bright Places” is Jennifer Niven’s first young adult novel. In her author’s note, she says that she wanted to produce something edgy, a book that draws from her own life experiences. Let’s start off here. I love POV shifts in YA lit. However, I think it’s really hard to pull off. Like “The 5th Wave. ” It was a cool book, but did it rock having a million POV shifts? Nah, not really. It was confusing and distracting and weird. It’s important to stick to two, maybe three, and really get to know those characters enough that you can develop distinct, riveting voices for each. That’s one thing Niven does really well. Finch and Violet are their own people. They start out very separate, but Niven manages to almost seamlessly interweave their thoughts as they come together and get to know each other better. It’s a refreshing way to develop characters and move through a story. Niven’s writing style is just as impressive. When someone writes in the YA genre, you have to be really comfortable putting words into teenagers’ mouths. If they sound too anything, you get accused of being out of touch with your readers. But if you dumb it down, your readers aren’t going to give it a second glance. It’s kind of a narrow window of “Yes, I could totally hear [insert your local teenager’s name here] say that.” Not many authors get there, but I think she’s figured it out. I also like how she plays around with technique. There’s a lot of your standard back-and-forth dialogue, inner thoughts, etc. but she also uses a lot of an unanticipated poetic constructs. Finch and Violet will be having a conversation and one of them will jump in with a couple stanzas of a popular poem. Or, one of them will break out with a poem in their moments of observation. Or, Niven will forgo prose and just start writing in poetry. It’s jarring, but it’s perfect. I mean, it’s just what you didn’t realize the moment needs. Like there’s this one chapter, and all it is is a few stanzas and I swear, I’ll never forget it. It makes such an impact. I wouldn’t have had that reaction if it was a short little paragraph. “All the Bright Places” is an endearing book, emotional and funny—but definitely not always fun—and it is inspiring. It’s thoughtful and observational, almost like a scientific study on mental illness in young people. What it looks like ignored vs. what it looks like with help. It’s a necessary book, one I didn’t know we needed (like the poetry). Read it if you’re emotionally prepared to read it. Read it if you’re not. Happy belated birthday! Your mom is not the only one who reads this! I love this review and how you analysed Jennifer Niven’s writing techniques! I adored ATBP even though I don’t usually read contemporary. The book had the most gorgeous prose and I love how it tugs at the heartstring without being emotionally manipulative. Thank you so much for reading! I agree, she’s really good at letting you choose how to react. Another good post- I’ll put this one on my “to read” list! It’s Simon’s birthday so plz enjoy this photo series, “Simon Does Stuff”, in which Simon does various things extremely well. Smashing trash. Eating waffles. Silently judging book purchases. Amazing. Iconic. I went to Yallfest 2015 and I am not okay.